This should be a staple in your anti-aging arsenal. 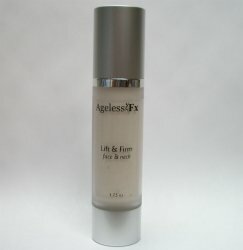 If you're over age 30, a cleanser, moisturizer and Lift & Firm are the minimum tools in your anti-aging toolkit. Over age 35? Time to consider EyeFx Gel and other treatments. And guys, read the above statement very carefully. They may not come out and say it - but your significant other is wishing you'd begin your own similar treatment, too! Tip: Dockworkers use Lift & Firm to relieve the dry cracked skin from their hands. Cardboard boxes draw away oil and moisture from their skin, leaving them chapped and cracked. Apply Lift & Firm, let absorb. Then apply World's Best Moisturizing Serum on top - we're told, nothing works better!